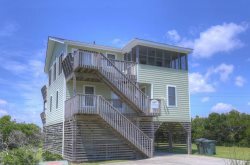 Perfectly situated in Kill Devil Hills, This first floor oceanfront condominium has beautiful views of the ocean. At Dutch's Place enjoy the ocean as your backyard and views of the Wright Memorial in your front. The condo features direct beach access, a spacious floor plan including two living rooms, a large dining area and all of the special touches that make you feel at home. Conveniently located near great local restaurants, shopping and attractions, experience all the Outer Banks has to offer right around the corner. If you have more than one family vacationing together, there is another Seaside Vacations home located in the same building. #SCR3B.